This trademark filing has been getting a lot of attention today. T’is said that the code numbers used are ones only used for actual games, rather than books or comics. The implication being that Mists of Pandaria is going to be the next World of Warcraft expansion. At any rate, that’s the assumption that a whole lot of gaming sites are running with. While Mists of Pandaria sounds intriguing, I find it hard to believe that World of Warcraft is going to base its 4th expansion around anthropomorphic panda. Or as they like to call them, Pandaren. A shame, because it would be pretty awesome if they did, but it doesn’t feel very serious. Not enough sorrow, death, corruption, and despair for a WoW expansion plotline. While I suppose you *could* put incredibly cute pandafolk into a horrible story, I’m not sure our heartstrings could take it. My suspicion is that the title has been trademarked just to wind the players up, as Pandaren have featured in several of Blizzard’s April Fools stunts. How many times must they tell us that Pandaren are going to be the next race before people start looking at this stuff a little more cynically? A fun little game for the iPhone released next April, maybe, but the next expansion? No. 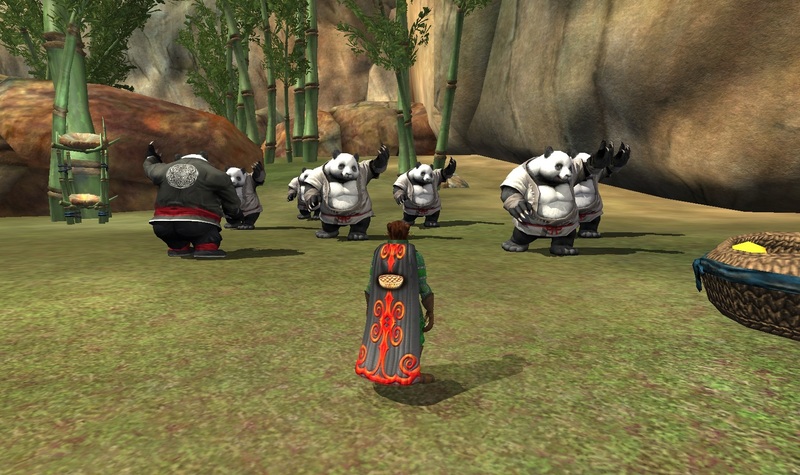 The picture below is of some completely unrelated, though equally cute, pandamen in EQ2, showing Maltheas the ways of Tai Chi, in the village of the Hua Mein. Not the Mists of Pandaria, but just as cute! Long-time readers may have some recollection of a series of posts I made about World of Lordcraft, an Evony clone that stole as much as is possibly could from World of Warcraft. I’m happy to report that the World of Lordcraft website now redirects to Blizzard’s site. There have been quite a lot of visits to my Lordcraft posts from Blizzard over the last few months, and I hope they found them useful :) Though, you know, if I saved your lawyers any time and all, I wouldn’t say no if you wanted to slip me a few dollars. Update: Turns out that while www.worldoflordcraft.com now takes you to Blizzard, Lordcraft simply went and got themselves another domain. Is even the might of Blizzard’s legal department impotent against them? Gearscore, the World of Warcraft app which decides how good your equipment is and assigns you a score, is loved by some, and despised by many others. It has long been used as a way for raid-leaders to decide who is worthy to join them on their terribly important expeditions, without requiring them to waste any thought on treating the candidates as individual human beings who are more than the sum of their equipment slots. Today, Gearscore has been taken over by Ten Ton Hammer, and it has become Playerscore. So now it’s not just your stuff that’s being rated and dismissed. It’s YOU!!!! PlayerScore is a way to get information about WoW characters, and help figure out how competent they might be. Not only does it provide automatic scores and profiles, it allows players to rate each other. You can view PlayerScore info in-game or on the Web, whichever you prefer. Some of it is gathered and uploaded via our AddOn and Updater. Much of the profile data is pulled from the WoW Armory. Allowing player-rating will be gamed by the guilds, and place individuals at even more of a disadvantage in the ratings than they already were. 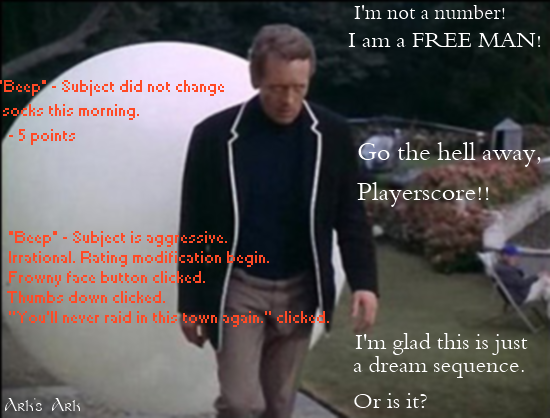 For me, the most ugly aspect of Playerscore is that you have no choice as to whether it will have power over you. We did not ask this unaccountable corporate entity (currently Master Games International Inc) to become the arbiter of who gets to do what in WoW. It does not ask you to opt-in to the system. You can’t even fully opt out. You can choose not to use it yourself, but that won’t stop it from being used against you. I consider this to be the greatest fault with the system. It should allow you to log on to its website, and tell it to stay the hell out of your business. Only when that is possible will a sufficiently large number of people be able to make a stand against this mindless and dehumanising add-on. Of course, the way that it essentially forces people that want to raid to use it, through peer-pressure, is the key to its success, so I would not expect to see that change any time soon. We are not the sum of our inventories. We are not numbers. We have context. I’ve been feeling a little low as so many of my friends are brimming with excitement over World of Warcraft’s Cataclysm expansion that is coming out in the next few hours. I’m not particularly jealous of the game itself, but that “Night Before Christmas” feeling is something I haven’t really felt about a game or expansion release in a while. Am I getting old and jaded beyond repair, I wonder? 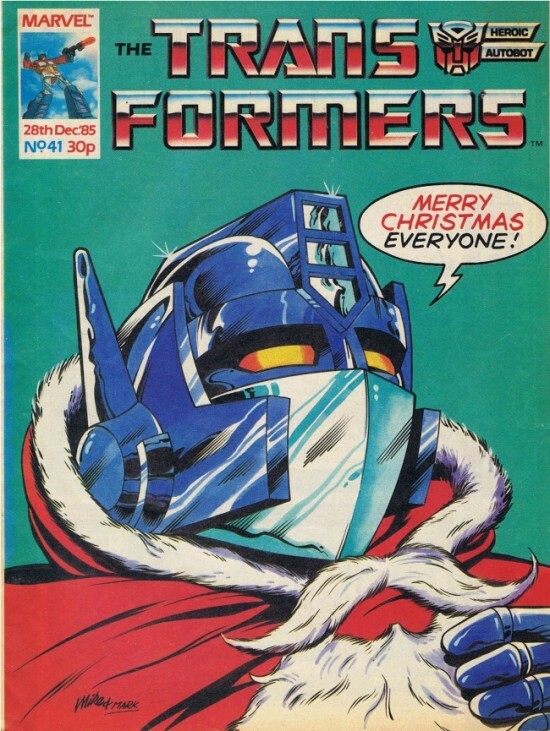 But then I look at Optimus Prime dressed as Father Christmas, and everything is better again. This was the cover of issue 41 of the UK Transformers comic. WoW: Osgard is on a goat. Osgard is on a goat. Pass the alekeg, let’s go. I’m on a goat oh ye Hordies take a look at me yo! 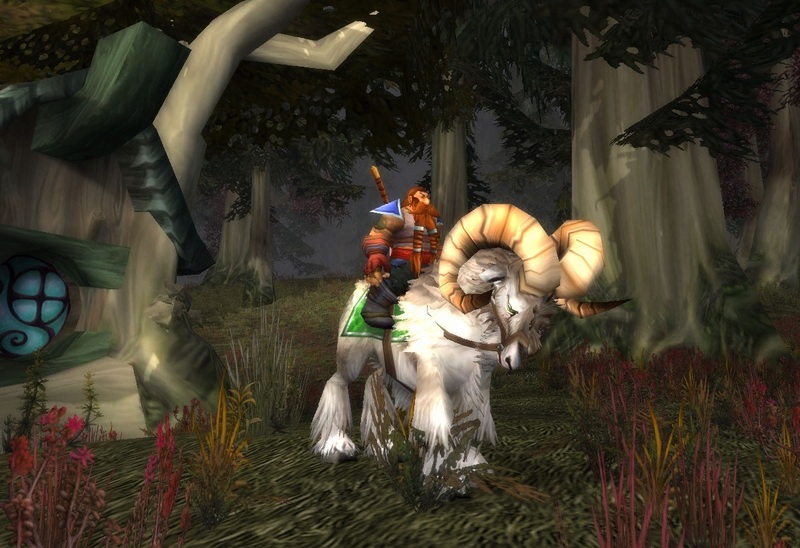 Straight blastin on me goat around Dun Morogh! Boostin 60 per cent, wind whippin at me coat! You can’t catch me ye daft trog because I’m on me goat! Fascinating indeed! You do know that’s actually a ram, yes? A ram being a male sheep, rather than any sort of goat. Oh, don’t let me interrupt. Pray continue with your fine song! Och! Nevermind. I not be feelin’ it any more. I was never able to afford a mount the first time I played WoW. This time, I easily gathered what used to be a rather large amount of money, five gold, by selling copper ore on the auction house. A single stack of 20 copper ore, which if you have some basic knowledge of where to find ore nodes takes just a few minutes to gather. But that’s real money. 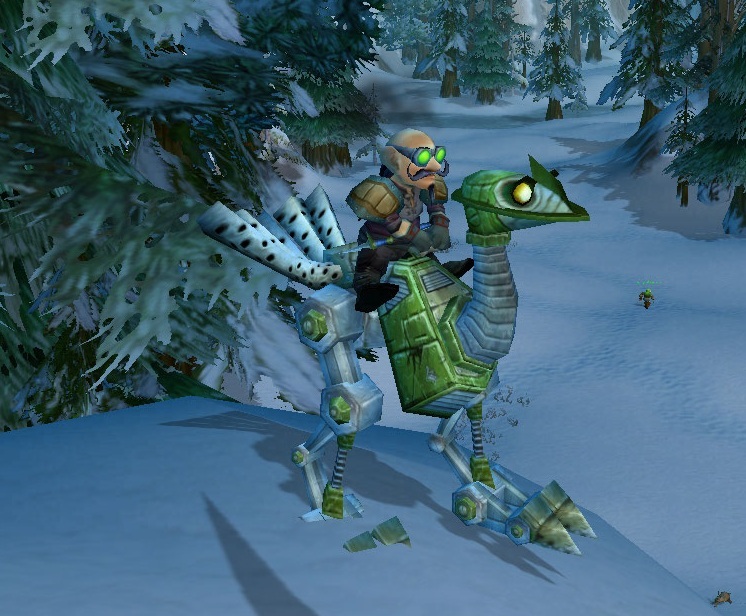 As a comparison, by level 20, when the mount and riding skill become buyable, Osgard had gathered about 1 gold through normal means. It’s not unusual for MMO economies to change drastically over the course of their lives. As the level cap rises, even the junkiest of the loot and quest rewards found at high level become worth serious amounts of money, so low level goods becomes valued by time investment, and the potential value of time increases with every expansion. To a level 80, ten minutes is probably worth significantly more than 5 gold. Anything which is sold player to player suffers from massive inflation, while things bought only from NPCs for static prices become comparatively trivial to acquire. Which is all good for me, as it has allowed a bit of a mount buying spree for my old characters. Skultroon is on a Green Mechanostrider. Where in the Multiverse is Osgard Blatterzarn? Just a little update regarding what I’m up to at the moment, as I’ve been a bit wretched at posting recently. Quite a number of my MMO-blogging twitter pals have been talking about World of Warcraft’s upcoming Cataclysm expansion in recent weeks. The old world zones are going to suffer great upheaval, with a lot of old content being replaced with new content that possibly even more densely exudes a sense of loss and corruption. It got me thinking that perhaps it might be a good time for me to pop back and see those old zones again before they change. I did not play WoW for very long, perhaps a month or two, so I don’t have anything like the same emotional attachment towards them as I do for EQ2’s older areas. Even so, I thought I would go on one last pilgrimage through them. This decision was made a lot easier with the knowledge that (once I managed to figure out my old login details, and convert my account to the newfangled Battlenet variety) I had some free time waiting for me, including a ten day upgrade to Burning Legion. In the four years since I last played I had completely forgotten how to play any of my characters, so I deleted and recreated my old Dwarven Hunter, Osgard, last seen being a Rogue/Paladin in DDO, and before that, an Engineer in Warhammer Online. Wherever there is evil to be vanquished, and gadgets to be played with, you’ll find Osgard! I’m always fond of pet classes. Possibly because I’m lazy, and would much rather have someone else do all that strenuous fighting for me. 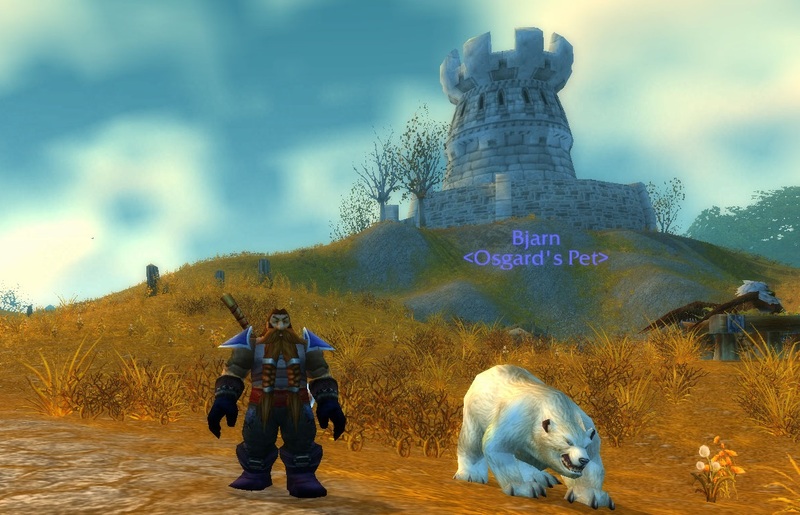 That someone, for Osgard, is Bjarn; a rare polar bear that can be found in the Tundrid Hills of Dun Morogh, if you can get to him before someone else tames or kills him. He’s functionally identical to every other bear, and I suspect every Dwarven Hunter these days knows about him and tames him, but he was my boon companion the first time I played, so it would have seemed ungrateful to head over to the Draenei lands and tame a giant moth. Osgard and Bjarn visit Westfall. I’m about halfway through my ten free days. I’ll be surprised if I resubscribe, but I may do for the lead up to Cataclysm, as it should be rather fascinating to see how well the game and its community deal with such massive change. If nothing else it has given me a few ideas for posts, and my screenshot folder is full to bursting!